Here’s one of the exercises we regularly use with runners and triathletes to assess and train Glute function to protect the knees. Kat, shown in the video below, is a GB Age Group triathlete, who has been suffering with patella-femoral knees pain when running. We’ve been working together to improve her running form and build strength as she works through a knee rehabilitation program. Thanks for that, it really helps as i have similar problems with knees and glutes. Is it mainly females who suffer this or is it more to do with weakness in the glutes? Are there any other exersices that will help with knee alignment? Keep up the good work! Hi Jo, thanks for leaving a comment! This type of problem certainly isn’t exclusive to the female population, although we do see it more commonly amongst women. 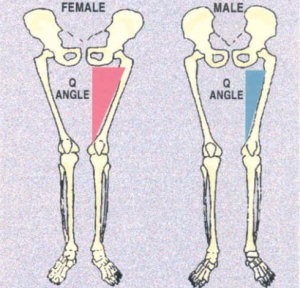 Anatomically this is largely due to the increased size of the Female Q Angle at The Knee, due to the wider pelvis. Great video James. Thanks. Out of interest, are you aware how much Kat pronates at ST when she lands? If so, is it affected when the band is used? Let’s say that along with Kat’s internal knee rotation, you do notice say a lateral rotation of the feet and her medial arches collapsing. You are confident that glute activation via the band jumps will eventually help relieve the PF pain Kat is experiencing, but in the meantime she has races and needs to train. Would you recommend a trainer / orthoses with medial arch support?